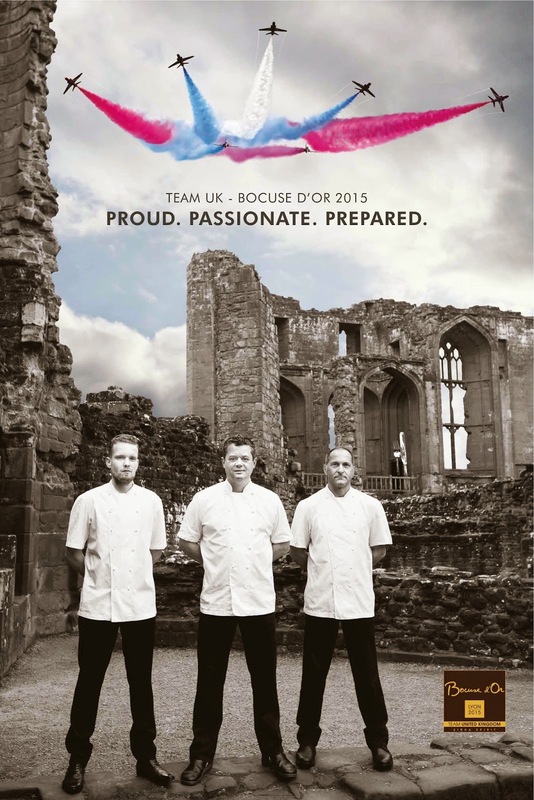 Bocuse d’Or Team UK has revealed its promotional poster, which can be voted for via the Facebook page of the Bocuse d’Or. Adam Bennett, candidate, Idris Caldora, Coach and Josh Allen, commis chef were photographed standing in front of the historic Kenilworth Castle, situated up the road from The Cross, the Michelin starred pub restaurant where Adam runs the kitchen. Team UK will compete in the Bocuse d’Or World Final on Tuesday January 27, 2015 - the first day of the two-day competition. 23 other countries will compete for a place on the podium, including Bocuse d’Or Europe winner Tommi Myllimaki from Sweden and Philip Tessier from The French Laundry who will represent Team USA. It will be the second final for Adam, who achieved the best result ever for the UK when he competed with commis chef, Kristian Curtis in 2013. They will be hoping to achieve similar success next year. Adam will have just under six hours to prepare, cook and present a yet to be revealed fish for 14, along with a meat platter using Guinea Fowl ‘Fermière des Landes, Label Rouge’. The rules specify that 50 per cent of the fish plate must be vegetable or fruit based ingredients sourced from a market set up the day before the contest. The meat theme must include three garnishes and will be divided into 14 portions for the jury. The platter will be produced and supplied by Heritage Silverware, a Birmingham-based family business which supplies bespoke tableware to many of the world’s finest hotels and restaurants. Preparing for the Bocuse d’Or involves a considerable amount of preparation which Adam will need to fit in alongside running The Cross, which was recently awarded a Michelin star. He is working with Warwickshire-based butchers, Aubrey Allen, who sponsor the meat for the Bocuse d’Or team. Synergy Print teamed up with official photographer Jodi Hinds, to create the team poster. The team is supported by financial donations with current sponsors including ACT Clean and Compass Group.